Posted by Laura Arnold in 2012 Indiana General Assembly, Uncategorized. Many of you already know that the 2012 session of the Indiana General Assembly adjourned during the wee hours of Saturday, March 10th. “It was nearly 2 a.m. Saturday when Indiana’s lawmakers concluded the 2012 legislative session, with the final votes passing a bill that addressed everything from the victims of last year’s State Fair disaster to taxpayers to schools. While lawmakers could have stretched this session out until Wednesday — the statutory deadline for them to finish their work — legislative leaders decided to cut the session short instead. After a bitter fight in January over the so-called “right to work” legislation, which brought thousands of protesters to the Statehouse and sparked days of boycotts by House Democrats, all were ready to wrap this session up. It was a grueling evening at the State House. So what do I mean by grueling? The last day of the session is typically physically but perhaps more importantly mentally demanding to the point of exhaustion. During one of the many recesses on the final day I saw Conference Committee Chairman Rep. Jeff Espich in the back of the House Chamber engaged in conversation along with Senate Democratic conferee John Broden. At one point, Espich put a stack of papers on the ledge by the large windows at the rear of the Chamber. I could read upside down that this was a Conference Committee Report (CCR) for HB 1072 because that appears in larger type and bold faced at the top of the page. I desperately tried to nonchalantly read the Synopsis upside down through the window without Espich noticing what I was trying to do. A few minutes later when Sen. Broden left the House Chamber to return to the Senate floor, I was able to confirm with Broden that the solar PV language was in the CCR circulating for signatures. Whew! What a relief. Even though you think you know what is going to happen, the final day of the session when law makers are dealing with Conference Committees it feels like you are in the Twilight Zone. Anything can and frequently does happen. The 800 pound gorilla was the lingering prospect of re-emergence of the tax credit language for the beleaguered Indiana Gasification, LLC, and SNG plant proposed for Rockport, Indiana. Although most Conference Committees start out with one House Republican, one House Democrat, one Senate Republican and one Senate Democrat, if one of the minority conferees, i.e. Democratic members does not sign the CCR they are summarily removed and replaced by someone, i.e. a Republican who can and will sign the CCR. Yup. That’s the way it works. After the four conferees sign the CCR, there is not an opportunity to amend the CCR. It is either voted “up” or “down” on the floor of the House and the Senate. If the CCR report is defeated, it goes back to the conferees for another try. After a Conference Committee Report (CCR) for HB 1072 was finally signed, state legislators suspend the rules and look over the CCR in the House and Senate Rules Committees. Following presentation to the respective Rules Committee members the CCR then goes back to both the House and the Senate for final roll call votes. For example, suspension of the House Rules then allowed a CCR to be considered on the House floor after merely 30 minutes. The House called down the CCR a little before 11:00 pm but was withdrawn a few minutes later because hard copies had not been distributed to House members. Later it was called down again around 11:49 pm and the roll call in the House approved HB 1072 about 11:53 pm by a vote of 87-8. The Senate did not vote on the CCR for HB 1072 until 12:28 am Saturday morning by a vote of 50-0. After the House and the Senate vote on the CCR then the Senate Pro Tem and the Speaker of the House sign the bill. This took place on 3/13/2012. The last and final step is approval by Governor Mitch Daniels. Once HEA 1072 reaches the Governor he has one week to 1) sign the bill, 2) allow the bill to become law without his signature or 3) veto the bill. The Governor has one week to act once it reaches his desk. You can track action by the Governor by visiting: http://www.in.gov/gov/billwatch.htm. The solar photovoltaic (PV) property tax exemption can be found in Sections 15 &16 on pages 10 & 11 of 191 pages. Posted by Laura Arnold in 2012 Indiana General Assembly, Feed-in Tariffs (FiT), Uncategorized. UPDATE: The Conference Committee for HB 1072 will be TODAY (3/6/2012) at 4:00 pm in Room 404 of the State House. The 2012 session of the Indiana General Assembly is entering its final week where the focus turns to Conference Committees to reconcile differences between the House and Senate versions of bills passed in their respective houses. The conference committee then meets at the will of the Chairman, in this case, Espich. The four conferees meet with their appointed advisors and work on a new version of HB 1072. Subject matter or content that has passed third reading in at least one House is eligible to be inserted into the Conference Committee Report (CCR). For example, it is believed that the tax credit for the controversial Indiana Gasification, LLC plant in Rockport, Indiana, may be inserted into HB 1072. The subject matter concerning Indiana Gasification, LLC was a part of SB 344 when it passed third reading in the Senate but it was removed by an amendment in the House Ways and Means Committee. (See http://wp.me/pMRZi-CI) Later SB 344 was not called down for second reading in the House (31 amendments had been filed). Therefore, SB 344 died. But most of the subject matter had already been inserted into HB 1072 in the Senate Tax and Fiscal Policy Committee by Sen. Hershman. HB 1072 then passed third reading in the Senate. HB 1072 now contains the property tax exemption for solar photovoltaic (PV) devices, however, with a simple stroke of a pen Rep. Espich can have the language removed from his proposed version of the Conference Committee Report (CCR). Rep. Espich already removed the solar PV property tax exemption once in SB 344 in the House Ways and Means Committee. The $64,000 question is will Espich remove the solar PV property tax exemption again from the CCR for HB 1072 or will he permit it to stay? As the conferees on HB 1072 meet, all four conferees must agree to a particular version of the revised bill known as a Conference Committee Report (CCR). After all four signatures are obtained, the CCR returns to both the House and the Senate for another roll call vote. There is no opportunity to amend a CR when it goes back to the House and the Senate. It is an up or down roll call vote. This is where the legislative process becomes like a tarantella becoming faster and faster until the end. There is a strong rationale for extending the property tax exemption to solar PV since it is already in effect for solar thermal, wind power devices and geothermal. Last session, however, Sen. Hershman amended the property tax exemption for wind systems so that the property tax exemption cannot be used if the owner is participating in a feed-in tariff program. Attempts were made to amend this language in the House Ways and Means Committee on SB 344 but these efforts proved unsuccessful. Hershman indicated that this issue should be addressed by “introducing a bill next session.” And then SB 344 died in the House. If your state legislator is either a conferee or an advisor, I strongly urge that you contact them immediately and express support for the inclusion of the solar PV property tax exemption in the CCR for HB 1072. Just follow the hyperlink to their official website listed above. You may also want to follow up with a phone call to their Legislative Assistant (L.A.) If you need help finding this information, please contact me via LArnold@indy.rr.com or (317) 635-1701. For more information about the Indiana General Assembly, please visit http://www.in.gov/legislative. The Indiana House Ways and Means Committee has scheduled a committee hearing on SB 344 on state taxation. SB 344 was amended and passed the Indiana Senate with language which now includes a property tax exemption for solar photovoltaic systems.See below for language in the bill. Leonard, McClain, Truitt, Turner, Ubelhor. The following previously scheduled bills are eligible for amendment and vote only. Sec. 26.1. (a) This section applies only to a solar power device that is installed after December 31, 2011. (2) is the owner or host of the solar power device site and a person consumes on the site the equivalent amount of electricity that is generated by the solar power device on an annual basis even if the electricity is sold to a public utility, including a solar power device directly serving a public utility’s business operations site. (c) For purposes of this section, “solar power device” means a device, such as a solar thermal, a photovoltaic, or other solar energy system, that is designed to use the radiant light or heat from the sun to produce electricity. (2) the assessed value of the real property without the solar power device. may have deducted annually the assessed value of the solar power device. on the date the statement is filed under this section. The statement may be filed in person or by mail. If mailed, the mailing must be postmarked on or before the last day for filing. On verification of the statement by the assessor of the township in which the real property, or mobile home, manufactured home, or solar power device is subject to assessment, or the county assessor if there is no township assessor for the township, the county auditor shall allow the deduction. Although I do applaud Governor Daniels move to lift the strict security measures at the State House, I do believe there is a need to enforce noise levels. I could be wrong but at times I felt that the decibel level generated by rallies and protests exceeded reasonable indoor decibel levels. The excessive noise generated by beating objects was disruptive to the point where a person could not hear themselves think no less have a conversation on their cell phone in the hallways. I sincerely hope that there is a way to impose reasonable noise restrictions without infringing on the public’s First Amendment Rights to “freedom of speech.” Maybe state lawmakers need to investigate a law to regulate “indoor noise pollution”. Yes, it does really exist my friends. That’s just my two cents. Gov. 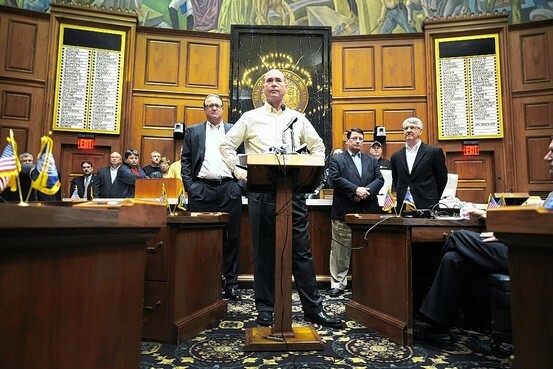 Mitch Daniels this morning rescinded the new security policy which had limited public access to the Statehouse. He said that the protests last year resulted in some groups, including schools, canceling trips. Daniels said it will be up to the Indiana State Police to decide whether to reduce the massive police presence at the building. While traditionally a handful of state police are posted at entrances and exits to the building, and in key places such as the governor’s office, today — the opening day of the legislative session — there were dozens of police, some with guard dogs, inside and outside the building. Long lines of the public, most of them union members here to protest the so-called “right to work” legislation,” queued outside the east entrance, the only door open to the general public. Lobbyists, reporters with ID badges and those with scheduled visits such as tour groups had expedited entry through the west entrance. The policy was announced on Dec. 30, and immediately was viewed by some as an attempt to stifle the union protests against the “right to work” legislation, which bans companies and unions from negotiating a contract that requires non-members to pay fees. Daniels and GOP legislative leaders have made its passage their top priority this session. Its passage from committee in 2011 sparked both large union protests and a five-week walk-out by House Democrats who wanted to stop it and other bills aimed at unions and public education. While it was pulled from the table in the 2011 session, the bill is expected to pass this session due to the large Republican majorities in both the House and Senate who favor it. But police said the protests of 2011 convinced them they needed stronger security policies in the building. This morning, the Statehouse resembled an armed fortress, with police even guarding one elevator that was designated for use by elected officials and their staff. Rescinding the policy restored that elevator to public use. Daniels said he initially did not overrule the state police recommendations because he considers himself a “temporary occupant” of the building. But reading what was said about the rules and listening to the criticism, he said, he decided Indiana should return to the old rules. “We may have one of the most open, if not the most open, environment of any place. It’s fine. We like it that way, as long as it works,” he said. We all understand the need for tight security at the Statehouse. For years, in fact, I questioned why visitors could walk into the state’s most notable government building without having to go through even the most basic security check. It seemed as if Indiana officials, in their admirable quest to hold onto the tradition of openness at the Statehouse, hadn’t accounted for events such as the Oklahoma City bombing and the 9/11 attacks. They finally relented and added screening checkpoints a few years ago. So I’m going to restrain myself and not pound my fist too hard on the desk as I talk about the newly enhanced Statehouse security rules. But those rules are worthy of a decent dose of outrage, as they seem to have been developed without much public discussion, without much concern for openness, and at a time that is certain to — coincidentally or not — frustrate labor union activists who are preparing to launch hallway rallies over anti-union legislation. Let’s make one thing clear: your view on the security issue should not be based on whether or not you support unions. While the unions are gearing up for a round of protests when the legislative session kicks off this week, this new policy will affect Hoosiers of all political ideologies, and perhaps many who just want to visit a spectacularly beautiful and historic building. Most important, it would send a clearly un-democratic message in the state’s epicenter of democracy. The part of the rule that has received the most attention limits the number of people in the Statehouse at any time to 3,000. After accounting for government workers, reporters and lobbyists, whose presence is essentially guaranteed, that means somewhere south of 1,500 visitors can be in the sprawling Statehouse at any one time. During days of heated legislative debates, that’s far too few. And in another swipe at convenience, the Daniels administration announced last week that visitors will have to enter and be screened at one Statehouse entrance, a move likely to cause long lines on the winter days when the legislature is in session. This unfriendly, old-school government rule runs counter to the customer-friendly message long espoused by the administration. I can’t prove such motive, and I hope that’s not what this is. But the timing sends a bad message, coming on the eve of a major battle over changes in union rules that the administration supports. Going forward, rallies over everything from home-schooling to abortion to taxes also could be affected. Security makes sense. But aspects of this policy do not. For instance, I was struck by a provision limiting the size of signs, often carried into the building by protesters. Such signs can be no larger than two-feet by two-feet. Is there really a safety concern so dire that citizens cannot be allowed to express themselves with larger signs criticizing lawmakers, legislation or their government in general? In the end, here’s my biggest problem with the new security rules: they have been arrogantly tossed down by state officials without fully considering the impact on ordinary Hoosiers. Those crafting the policy should have had as their goal passing rules that, while providing safety, seek to ensure as much public openness as possible. Every new restriction should be a last resort. When lawmakers gathered in November, House Speaker Brian Bosma, R-Indianapolis, celebrated the many “historic transparencies” the House has adopted in recent years, such as making sure all House proceedings are available on the Internet. Those changes have been wonderful, and Bosma, who has long championed them, should be at the front of the line of critics of this new policy. He might consult with Sen. Mike Delph, R-Carmel, who has questioned the constitutionality of the new policies. Of course, this doesn’t mean protesters should be allowed to disrupt the work of government, or that crowd control efforts are inherently bad, or that an occupancy limit of some kind isn’t necessary. It simply means people deserve the chance to be heard by their lawmakers, even if that is sometimes uncomfortable. Since learning of the new policy, I’ve had this vision: On a cold winter morning sometime this month, four Indiana residents get in their respective cars and head for Indianapolis: A home-school advocate from Marion, a union worker from Evansville, a small-businesswoman from Madison and a tea-party activist from Valparaiso. As Hoosiers before them have for generations, all four want to go to the Statehouse to express their views — whether those views are conservative, liberal, moderate or nonpartisan. But when they arrive at the steps of the state’s most majestic building, the doors are closed. Others who got up earlier, or who had fewer miles to travel, or who were part of a better organized group, have already filled the People’s Building. And with that, as one critic said last week, the Statehouse will be the People’s Building no longer. Reach Matthew Tully at (317) 444-6033 or via email at matthew.tully@indystar.com. The 2012 session of the Indiana General Assembly reconvenes tomorrow on Wednesday, January 4, 2012. The short session or non-budget session of the Indiana state legislature takers place at a very quick pace. In the recent past state legislators were not in session on Fridays, however, because state lawmakers will be in recess for the Super Bowl from February 1-6 (Super Bowl is on February 5, 2012) the Indiana House plans to be in session on Friday’s in January. Some deadlines have already passed. The internal deadline for most House members to request bill drafts from Legislative Services Agency was in mid-December 2011. Also Friday, January 27th will be the deadline for Committee Reports to be filed in the Indiana House. Therefore, bills introduced in the House will likely need to receive a committee hearing no later than Thursday, January 26th. That gives just three weeks for committee hearings. Rep. David Yarde II (R-Garrett) is expected to file a bill addressing expansion of the state property tax exemption for solar pv. WATCH THIS BLOG FOR DETAILS! If you are interested please send an email to: IndianaDG.org@gmail.com. Get involved! Check with your local Chamber of Commerce, newspaper or public library to find out when Third House or Legislative Town Hall meetings will be held in your community. This is one of the best ways to meet and to talk to your state legislators without coming to the State House. Mon., Oct. 24, 2011 Senators may begin filing bills for the 2012 Session. Fri., Jan. 6, 2012 Deadline for filing Senate bills (Senate Rule 48(b)) not later than 4:00 p.m.
Wed., Mar. 14, 2012 Last day for adjournment of both houses (IC 2-2.1-1-3(b)). Just in case you doubted the importance of the “right to work” battle during the 2012 session of the Indiana General Assembly, then you need to read the article below from the Wall Street Journal which ran on page A3 in the Tuesday, November 22, 2011 edition. I think this article helps to put the issue in perspective nationally. Clearly “right to work” will be the 800 lb guerrilla in the room during the 2012 session of the Indiana General Assembly. Indiana House Republicans said Monday they would make passing a so-called right-to-work bill their top priority in the coming legislative session, re-opening another front in a battle over labor unions that has roiled much of the Midwest this year. Indianapolis Star/Associated Press Indiana House Speaker Brian Bosma, center, said Monday that Republicans would make passing a ‘right to work’ bill their top priority. The Indiana bill would affect the rights of all private-sector workers, allowing employees at unionized companies to refrain from joining the union and to avoid paying union dues. Republicans and some company executives say such a bill would create jobs in a state where unemployment stands at 8.9%, while Democrats and labor leaders say it wouldn’t help unemployment and would crimp incomes. 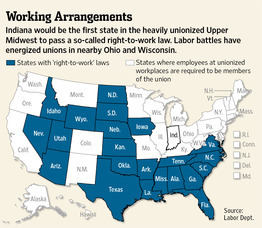 If the measure succeeds, Indiana will be the first state to pass a right-to-work law since Oklahoma in 2001, though such measures have been proposed in many state legislatures this year. Currently 22 states have right-to-work laws, and they tend to have the lowest unionization rates. The Indiana announcement comes just weeks after neighboring Ohio voted by a wide margin on Nov. 8 to repeal a broader law limiting collective bargaining for public-sector workers. A Wisconsin law similar to the Ohio bill, meanwhile, was a driving factor behind the campaign launched last week to recall Republican Gov. Scott Walker. Republican House Speaker Brian Bosma said his state’s situation was different from Ohio’s as Indiana Gov. Mitch Daniels, a Republican, had already abolished collective bargaining for public employees, in 2005. The Indiana law would be less controversial, he said, as it applies only to the private sector, where a smaller proportion of workers are covered by unions. In addition, it wouldn’t affect police officers and fire fighters—a big reason for the opposition in Ohio. Mr. Bosma said that he planned to introduce the bill Jan. 4, the first scheduled day of the new session. “It’s very clear that we’re not going to be able to dip into the quarter of a million Hoosiers who are out of work without addressing the last barrier to job creation in our state,” he said in an interview. House Republicans said some executives at site-selection firms had told them business leaders would prefer to relocate to a state with weaker union protections. Democrats and union leaders said the measure was an attack on the existence of unions, and vowed to fight it. When Indiana Republicans pushed a right-to-work bill in the spring, most House Democrats fled to Urbana, Ill., refusing to return until after the GOP withdrew the plan. House Democratic Leader B. Patrick Bauer said passing a right-to-work law would lower wages and make workplaces more dangerous without bringing new jobs to Indiana. “It’s disappointing that they’re not reading the actions in other states, where the public is repulsing and repealing these anti-worker bills,” he said in an interview. He said he wouldn’t rule out Democrats leaving the state again, but said they had other options. The Indiana AFL-CIO, which represents more than 300,000 workers, said it would fight the bill. “It forces organized labor to represent workers who refuse to pay for services, thus severely depleting their ability to effectively represent dues-paying members,” said Nancy Guyott, president of the state chapter. Mr. Daniels last year advised Republicans not to push a right-to-work bill, saying it would distract the legislature from education changes he wanted to make. In recent weeks he has said he expects lawmakers to propose a bill again, but declined to say whether he would campaign to pass it. A spokeswoman for Mr. Daniels said Monday the governor would explain his views at a later date. In an interview this month, the governor claimed Indiana loses one-third of potential business relocations because of its strong union protections.